CHASING FOOD DREAMS: Zuan Yuan, One World Hotel: It’s a Hot & Spicy Lunar Affair! 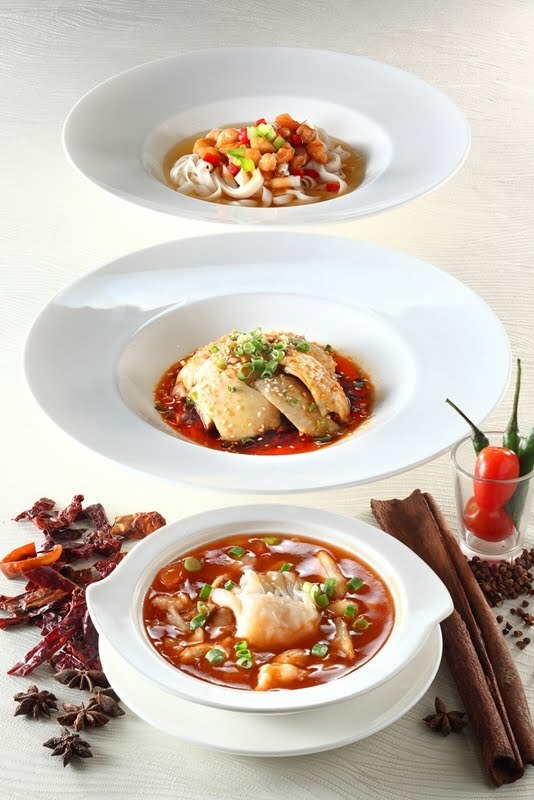 Zuan Yuan, One World Hotel: It’s a Hot & Spicy Lunar Affair! A Sweet and Spicy Mid-Autumn Festival! 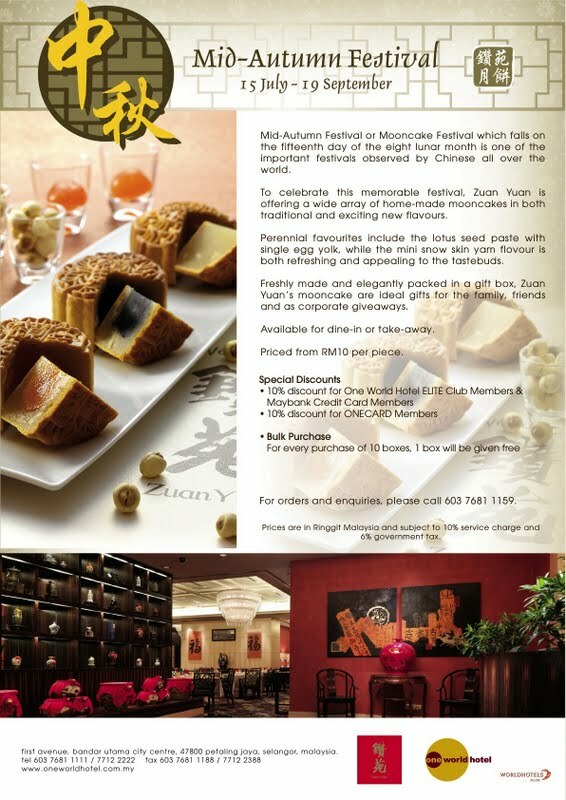 If you haven’t had enough of mooncakes yet, here’s one more to add to your list to try! Back at Zuan Yuan Chinese Restaurant at One World Hotel, it’s a hot and spicy September with the flavor of the month showcasing Szechuan cuisine. Guests are in for a sweet and spicy treat of Szechuan and Mooncakes! Szechuan cuisine is synonymous with pungent flavors and heat. One of the more popular regional cuisines of China, Szechuan cuisine is kick up with their liberal use of garlic, Szechuan peppercorn and pepper oil. A variety of Szechuan dishes are available for lunch and dinner at Zuan Yuan from 1 to 30 September 2013. Prices start from RM10 per dish onwards. I never did tell anyone but if I ever see a Hot and Sour Szechuan Soup on a menu, I‘d order it. This version has a refine balance of flavors. Not overly spicy but tangy enough, it is a bit more toned down from the classic one. It has the usual finely shredded ingredients and the broth is lightly starched up. What really shines in this soup is the dumpling. Plump, juicy and filled with a bouncy filling of seafood, I could certainly do with a few extra dumplings! I think this dish rocks! It was my favorite for the night. Big prawn balls have great wok heat and are definitely spiced up with pungent strength of the chili. The crustaceans are cooked to perfection with a sweet firmness in every bite. Providing extra textures are lightly tossed onions and dried chili pepper. Flavors are just spot on for me as I really enjoyed the overall greatness of this dish. It is a very simple dish with minimal ingredients but rest assured, this is a dish with big flavors. The smoky aroma is gorgeous. One gets light crunch from the cabbage with a nice sweetness complimenting the pungent spicy black bean sauce. Unless you are not a fan of cabbages, it would be hard to resist enjoying this dish with a piping bowl of steamed rice. This one uses a wider noodle than the classic one for most Dan Dan noodle. It does have better texture and was cooked nicely. The sauce is fairly light with a mellow spicy hint. It has good flavors with the seafood and bell peppers. Though the flavors are fine and lovely, I thought it was a bit too light for a Dan Dan noodle. Dan Dan noodles are famous for strong and pungent flavors but nevertheless, the Dan Dan noodles here is still delicious in its own way. Here comes the touch of sweetness after our spicy meal. This year, Chinese Dim Sum Chef Jordan Chin brought back an ensemble of classics and modern creations. For traditional oven baked mooncakes, new flavor introduced is the single egg yolk white lotus with black sesame paste as well as the tiramisu with mung bean paste while for snow skin mooncakes include the seaweed lotus paste with single egg yolk and salted white lotus paste with single egg yolk. We tried a few mixes of classics against modern. Pretty well made, its has a good amount of sweetness and the fragrance of the white lotus is lovely. At sight, it also looked good as the skin is thin and the white lotus paste is golden and pale. It’s a classic well made! I didn’t expect this but I have to say the Pandan Lotus Paste is spectacular! This is one of the best pandan lotus pastes I have had in all my years of tasting mooncakes. The pandanus aroma is so heady and deliciously awesome. We all raved in unison of this mooncake and this platter was also the first to be clean out. High marks for this awesome classic!! Again just not my cup of tea but it has great depth of flavors. Jam packed with lots of textures of nuts, seeds, ham and maltose, it is still a favorite among the elders. A first for me but this one rates top among the modern mooncake category! The seaweed flavor is distinctive and exudes a savory sweet filling together with the salted egg yolk. Unless one does not like seaweed, there really is no excuse not to like this one. This one is savory and sweet all together in harmony. Going healthy, it’s another first for me to savor a multi grain version. There are crunchy bits of sesame seeds and multi grains in this one. For those who are health conscious, this one may just be for you. The mooncakes are available in beautiful gift boxes of four or eight pieces from 15 July to 19 September 2013. For orders or enquiries, please call Zuan Yuan at 603 7681 1159.
wow, your favourite hot & spicy SzeChuan food! It must be a enjoyable dinner for u! Never got used to "Supreme Mixed Nuts and Chicken Ham" ! but the "Multi-Grain ..." version looks and sounds good !